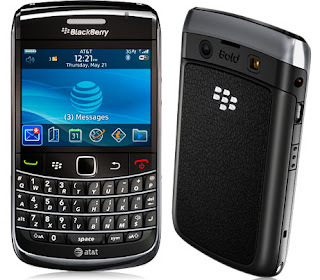 One of my relatives upgraded their phone and gave me their Blackberry Bold 9700. I have been using it for a few weeks and I thought I would post a review of the phone. I will go over the hardware, features and usability of this phone in this review. The phone itself is very nice looking. It is black with chrome lining and has a leather texture on the back. It is a nice size and it is fairy easy to hold. The full keyboard is pretty easy to use and the screen is crisp and easy to read. Call quality is as good if not better than most cell phones I have used in the past. It has a camera with a flash that takes decent looking pictures. The Blackberry Bold however has many annoyances I have found. One is navigation. It seems like there is always an extra step involved that should be unnecessary. For example, the home screen gives you a bottom row of icons to choose from. You have to press the Blackberry button to get to your full screen of options. The home screen should already have all these options or at least give you the option to customize it with as many icons as you want. When I started with the phone, I wanted to clear all the contacts. There is no easy way to do this. You have to clear basically everything on the phone if you want to delete the contacts. Adding new contacts is overly complicated. The thing with Blackberry is they give you too many options you don't need and they overlook some of the basic things you do need. When you add a contact, you want the name and number right? On a Blackberry, they give you a list of about 30 things to fill in when you want to add a new contact. Adding the actual number is far down on the list and even when you find it, you have to put it under "Work 1" as the primary number. Maybe some people want a place to up address, birthday, and anniversary, but for me, I just want the name and number. When I put my sim card into the phone, it automatically added a $25 data plan to my bill. I was not pleased about this especially since there is a $15 data plan available. I have since tried to downgrade to the $15 plan and it will not let me. I rarely use the data options so paying $25 just to use the phone is not worth it. I will probably end up switching to another phone without a data plan and then sell the Blackberry. Overall I think this phone is good for texting and keeping track of detailed information about contacts. It is ok for web browsing, but not as good as touch screen phones in this area. Update 4-8-15: Wow hard to believe it has been almost 5 years and I still have the phone. Most people seem to update phones every year or 2, but this one has been great and I still use it. It is showing it's age in that it is not a touch screen and does not have all the iOS and Android apps, but I don't mind. Nice to see Blackberry is still making phone even with all the competition. Labels: blackberry bold 9700 review, blackberry bold review, blackberry review, review of black berry bold 9700.